What is Tutors for All? Hear what students have to say about their tutors and learn how YOU can help close the achievement gap. This entry was posted in Mission, Tutors for All Blog: One Student at a Time on April 27, 2013 by tutors. How are we bridging the achievement gap? Fewer than 2 in 10 public school ninth-graders will graduate with a post-secondary degree. 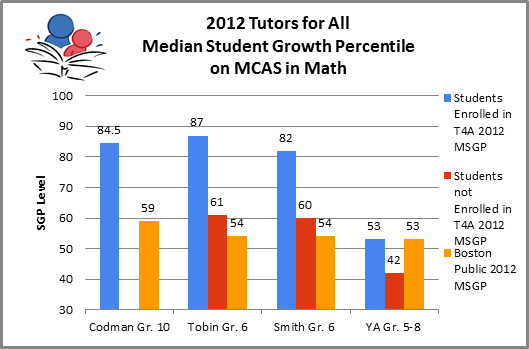 Tutors for All bridges the achievement gap one student at a time. Through bringing together colleges, schools, and community resources, we offer underserved students the systematic individualized instruction they need in order to thrive. Our programs transform the lives of Boston youth and the college students who tutor them. In the process, they are establishing large-scale individualized instruction as one of very few educational interventions successfully preparing underserved students for success in college and beyond. Tutorials are individualized instructional sessions led by personally matched work-study, service learning, and volunteer college students. Skills-based (for the most part, math and reading). What kind of tutorials has Tutors for All successfully run? Help us close the achievement gap! This entry was posted in Mission, Results, Tutors for All Blog: One Student at a Time on April 27, 2013 by tutors. Tutors for All is pleased to announce that it has been accepted as a placement site for Student Scholars participating in the Civic Engagement Program at Northeastern University. The contribution these bright and dedicated students make to our organization is invaluable! This entry was posted in Tutors for All Blog: One Student at a Time on April 27, 2013 by tutors. Boston Cathedral High School and Tutors for All anticipate that approximately ninety-percent of all participating students will be at or above grade level in English and math by the end of the first year of the program. Thus far, mid-year assessments have the students on pace to achieve this goal. Read the full story. This entry was posted in Results, Tutors for All Blog: One Student at a Time on April 27, 2013 by tutors. How Do We Write Curriculum? February 2018 Tutor/Student(s) Spotlight: Luis, Veronica, and Pallav! Tutor Student(s) Spotlight: Paul, Jaylan, and Jaila! Aaron Hume on Meet Our Coordinators: Kyle, Rachel, and Aaron! Mark on Meet Our Coordinators: Kyle, Rachel, and Aaron! Sally Schloemann on Meet Our Coordinators: Kyle, Rachel, and Aaron!